The Kobayashi Maru is a geek reference from Star Trek. At Star Fleet academy, cadets destined for command are given a no-win scenario which is used to assess their character and quality. As the Star Trek canon goes, you, the commander of a starship, get a distress signal from the Kobayashi Maru, a freighter, which has hit a gravitic mine. The ship is in distress within the Neutral Zone, a kind of 23rd century DMZ, and entering it would be construed by the Klingons as an act of war. It’s a setup -if you attempt rescue, you are immediately set upon by a fleet of Klingon ships. Kirk is famous for declaring “there is no no-win situation” and is famous for having “won” the Kobayashi Maru simulation while at Star Fleet Academy by reprogramming the computer-based Klingons to have fear of “The Captain Kirk.” He cheated, but was commended for original thinking. It is a truism that in the end you die. In that respect, life is a very long Kobayashi Maru scenario, a no-win situation where the end is known. You can’t escape, you can’t win. But that isn’t the point of Kobayashi Maru. It is how you conduct yourself as the ship goes down -are you helping people onto the lifeboats or are you elbowing people out of the way to get on one? Went to Hype for probably the last time in 2008. Am probably going to shut down for the season. 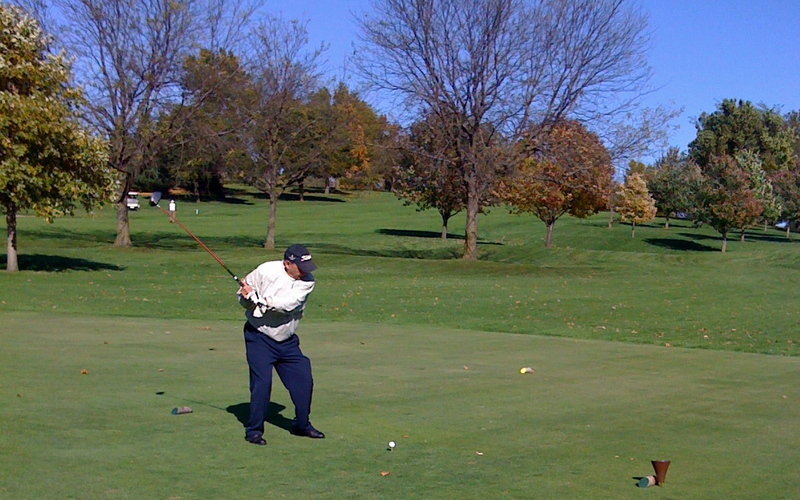 Am planning on regular visits to the golf hut out at Wakonda. 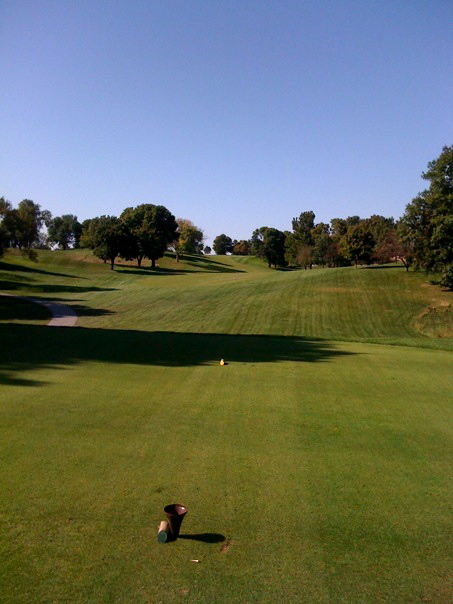 The course was relatively empty, and had a very pleasurable round on a windy but sunny day with my dad, DH, and Mr. RJ. Hype was truly a gem today, and I finally understood the thinking behind her design. Firstly, she was never meant to be played with a titanium driver. From the middle-aged-guy-who-is-sensitive-about-shrinking-length tees (Green), I was zapping the ball today to pitching and sand wedge length. 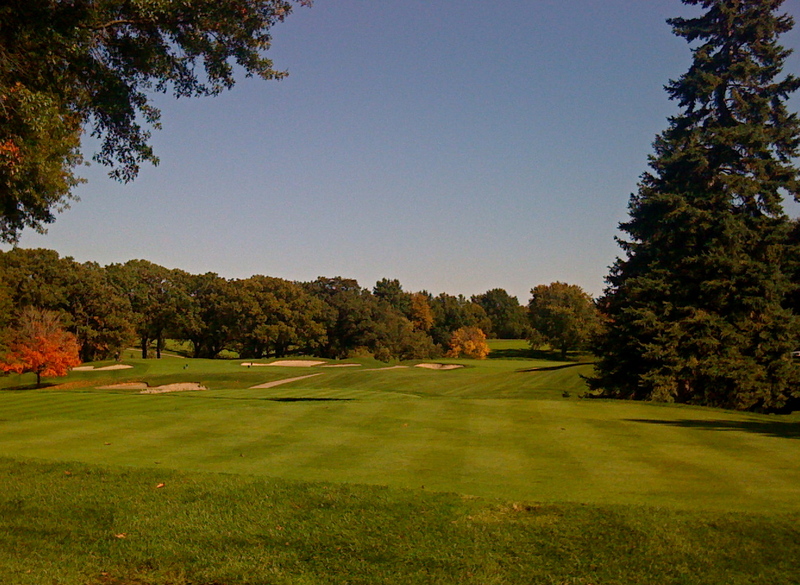 The course would be a wicked test with hickory shafts. The members here understand that and actually have a classic equipment tournament where you have to play with niblicks and mashies. The greens which I originally thought were a bit one dimensional (all featuring that built on a slope, look at the horizon! fakeout illusion featured on Wakonda #4) displayed their teeth. The greens matched up very well today. The fall colors framed a very pleasant day. 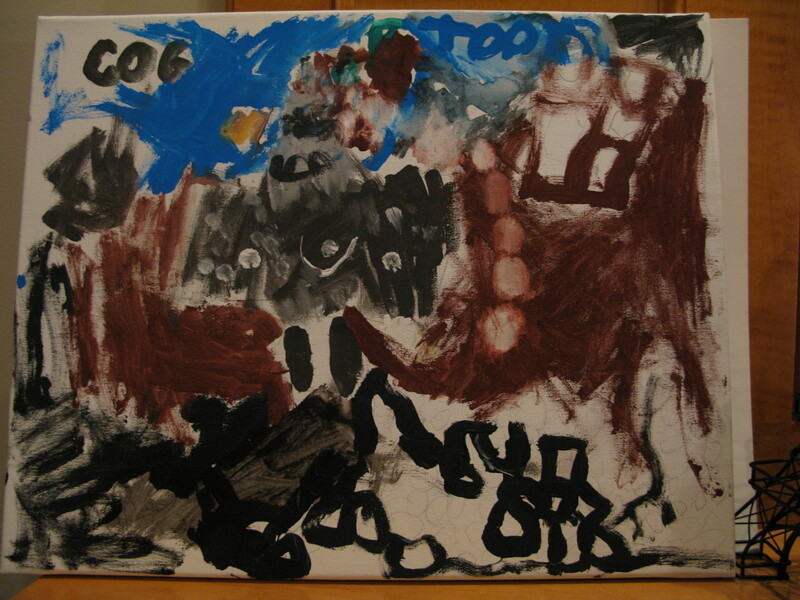 I dreamt a happy dream last night. It was a perfect round of golf played at even par. The putts rattled in. The feel was natural. That great feeling though turned into dread as I had the feeling that I was the last person playing. A sadness mixed with a chilly fear, of ghosts watching. I hit a ball out of bounds and took stroke and distance, yet the next shot rolled in for par. And then I knew that it was all a fake. I shot backwards and the wind picked up and blew the ball the right way. I was in that place because all suffering had been removed from golf. I stopped playing, and a beautiful angel lit next to me. She asked why it was I had stopped. I complained that no matter what I did, my score was par. She spoke, telling me that the greenskeeper had made it so, and my path around the course was already mapped out for me in this book she handed me. It was bound in black leather and the pages’ edges had been dipped in gold. It’s title, Your Round. I ask, how can I manage my game if everything was already preordained? But you do manage your own game, she said, and the greenskeeper maintains the course to suit his plan. What of my free will -where is that in the context of this grand plan? I might as well be hitting the ball randomly with a stick, with no plan and no goal. However you choose to think of it, it is your choice, made freely, she said with a smile, floating back to the blue sky. I stopped playing right there. 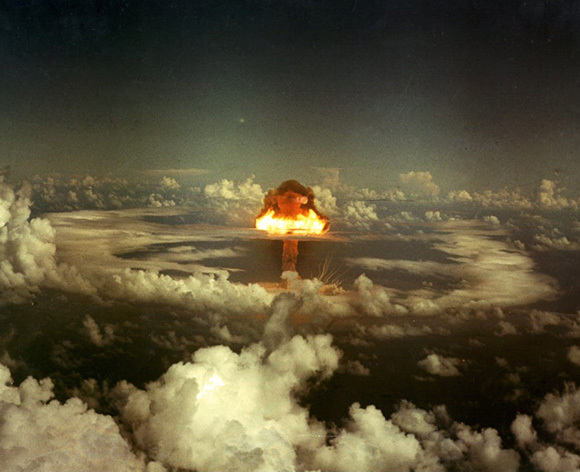 I made a thermonuclear device, and I detonated it, out of my own free will, to destroy the plan of the greenskeeper, who, I decided, was my jailer. An infinity of golf balls flew outwards, traced their separate arcs, and landed on their respective infinite targets, rolled to the hole, and dropped. 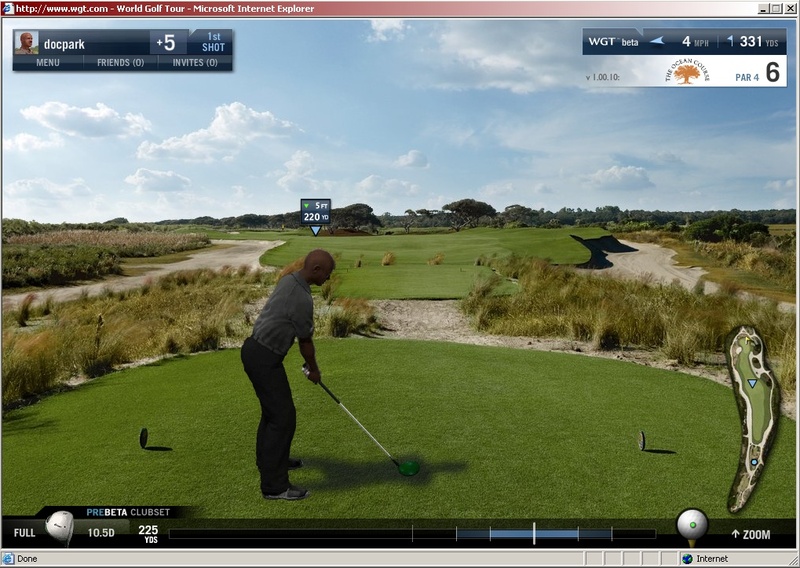 World golf tour which was stuck in a permanent mini-trial state has finally gone full beta with two courses and social network structure. The images are in high def and all you need is a high speed connection and windows explorer browser. The detail is very good, I think better than Tiger Woods. You can hear the productivity being sucked into this game faster than you can say Dow 5000. You only get a choice of three avatars, but luckily, I found one that looked just like me. That’s why I’m voting for the Korean guy, just like that other Korean guy Colin Powell. 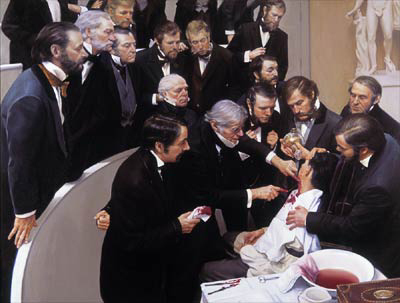 We just past Ether Day, the anniversary of the first operation under general anesthesia performed at Massachusetts General Hospital on October 16, 1846. Imagine operating without anesthesia, being held down by burley attendants, swigging a shot of whiskey for numbness, and biting a bullet for perseverance. 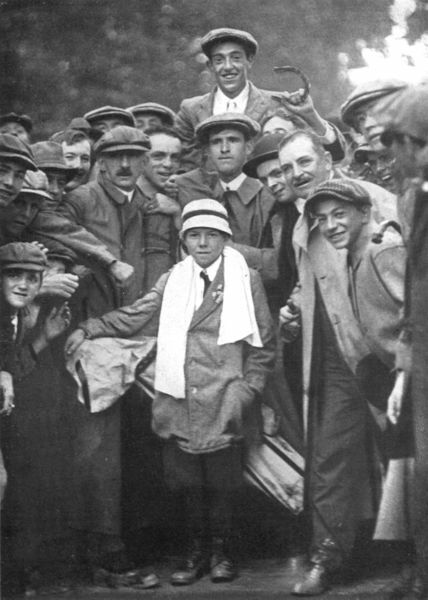 For golf, its game changing Ether Day had to have been Ouimet’s victory at the Open. The coming election day is such a day. Despite the efforts of people trying to declare parts of America un-American, do the American thing and vote. I just did yesterday. Certain things bind us together and other things will drive us apart. Remember, even in competition, Ouimet and Vardon were gentleman. We can’t let the coarse turbulent rhetoric become the epitaph of American unity. After the election, the effort has to be made to bring everyone back into the fold. Compassion and sportsmanship has to return to politics or we will see a disUnited States. Wakonda shows me her incisions, healing nicely. 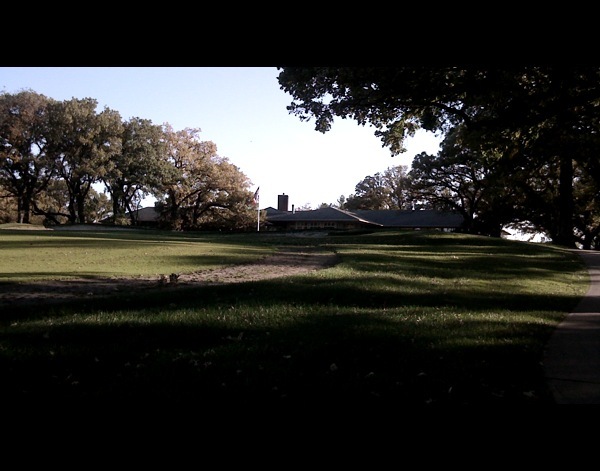 Fall at Wakonda is usually a brutal time. The fabric of space-time rips and golf balls disappear into these multi-dimensional portals. I’ve lost golf balls on the greens due to the leaves. I imagine these balls falling through some worm-hole and ending up as the cherished plaything of some child in the Pleistocene. I digress. The renovations have been something I’ve mostly watched from the parking lot and driving range. 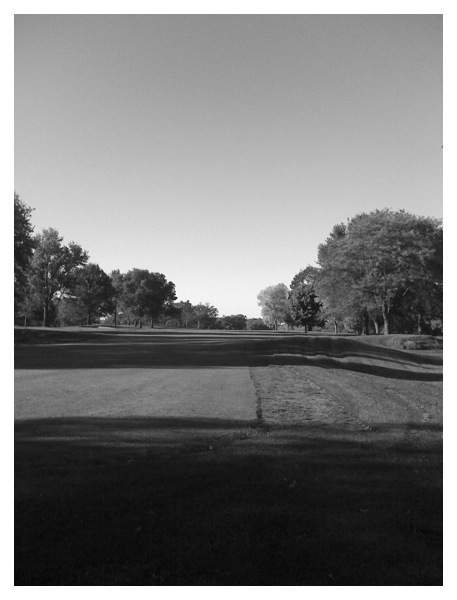 I decided to take a golf cart for a spin around the course with my iPhone. The new grass has taken, and the course looks ready to play. The grass on the greens has been mowed and does look great. The image to the right is the new practice green which greatly expands the area. New topography, including moguls and half-pipes, have been added. What I look forward to is having the practice green reflect the quality and nature of the actual greens on the course. I thought that the practice green had become a bit of a Potemkin green that looked a lot better than the actual greens on the course -now they are one and the same. The drive was pleasant -and obviously popular as I saw another pair on a golf cart driving about. I drove up to number ten, which wasn’t changed at all. 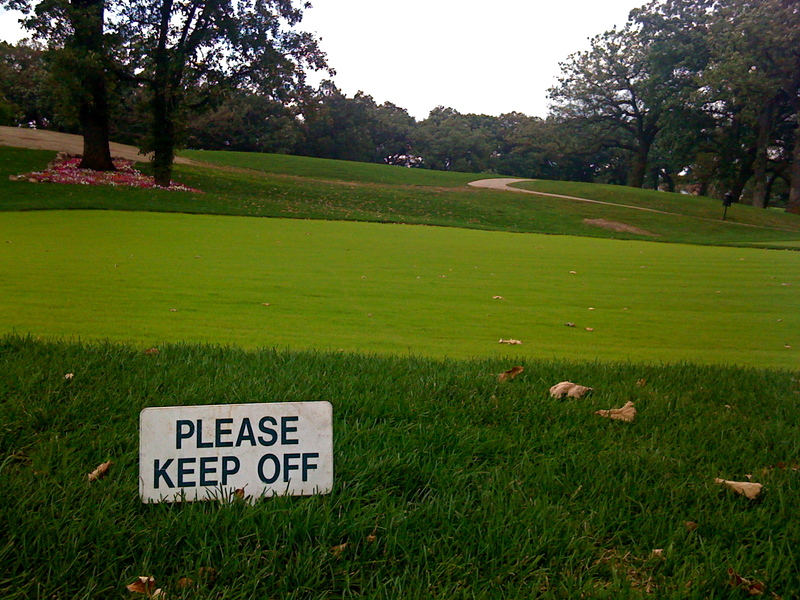 In fact, I could have hit approaches onto number 10 with impunity as the green had already seen action having been put in in 2007. I turned about and peaked at number 8, which didn’t strike me as much different. And then I saw number 11. 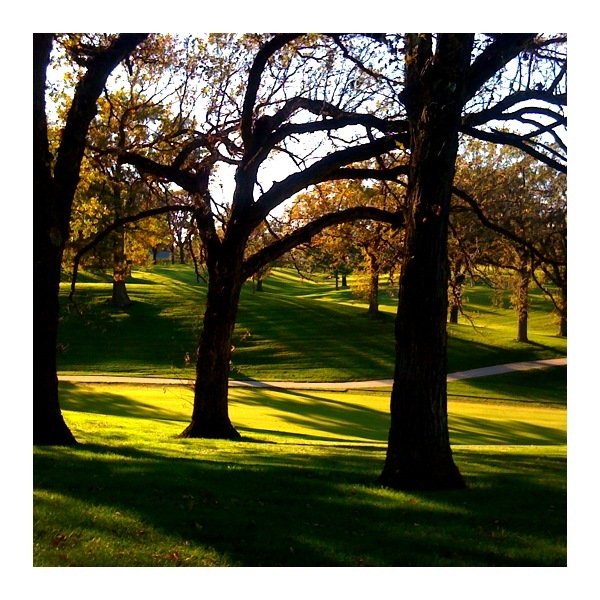 Shown here on the left, I had featured it on an earlier blog entry as the “Carnival Hole.” The big Misery Tree was gone. So had the Crown of Thorns -the oaky headdress at the top of number 11 which shaded the green. It was a different look, and it took a moment to get used to -in fact, it will take a long time. The basic premise of the hole is now different. The drive no longer has to be left center and long. You can be fade right and have a reasonable approach. The pit of despair to the right hasn’t changed. Balls will still roll down and away if they come in too hot. Here was the surgery revealed to me. It was like a face transplant. The skin was different and new, but the underlying bone structure was the same refined, beautiful Wakonda. As if to add emphasis to the change, the stylist cut back the hair, daring the observer to comment about the surgery. And where are the scars? They will be on your soul, my friend. I cut back and down number 17 which hadn’t changed too much, and up 18. The trees lining the fairway were are still there -these are signature features and won’t be touched unless they become unstable or are blown down. As we end the long march to the new presidency, I realize that in many ways, the renovations were not that painful for this member. Compared to the presidential campaign, the renovations were a breeze. Growing tomatoes takes longer. 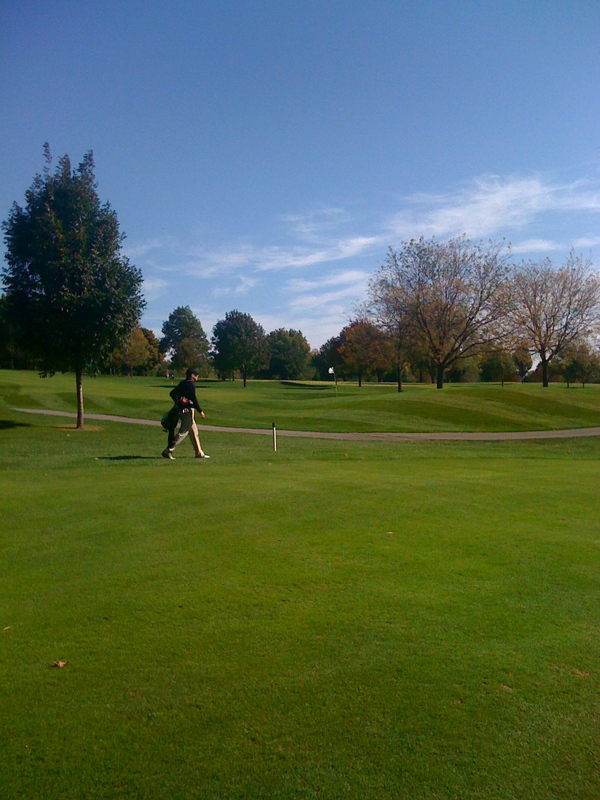 During that time, I sampled the golf fare at other courses and made new golfing friends. The fellowship of other golfists leavens the soul, and a new golf friend is a welcome ally against the oncoming Troubles. The ride up number 18 shows it hasn’t been changed. Seeing Ol’ Glory flapping above the green invigorated me. Presidents will change, and times will get tough before they get better, but golf will always be there. Remember, golf clubs can always be repurposed into dinner catching rabbit dispatchers. Today was one of those perfect days that are given to us to ponder why we should get so few. The weather was crisp and the light was clear. My mind was empty of all things except for golf, and I was playing purely with my brainstem and spinal cord, with minimal interference from the existential monkey that is driving the car. I played with my dad and DH. We all played in the same range -in the mid nineties -which for me was fine as putting seemed to work today -lags to inches were frequent. Couldn’t drive onto the fairway for anything. My dad has taken possession of my R7 driver -will be taking it to Florida. DH played well in fits and spurts, but couldn’t have been satisfied to be in the mid-nines, being usually ten strokes better. My father had one of his best driving days. Most of all -Hype was playing fast -we finished out in 4 hours which is practically speed golf at Hype. Couldn’t figure it out -it seemed packed. The course was in fine condition, and I can’t figure out why they want to redo it. And Hype has grown on me. Its parts all fit. The holes tell a flowing story. Sure, some of the parts on the lady are a bit bland, but she brings attention to standout features like number 8, and the green so green that your eyes were left unable to focus for a while. The past two weeks in the political race have brought me to drink. 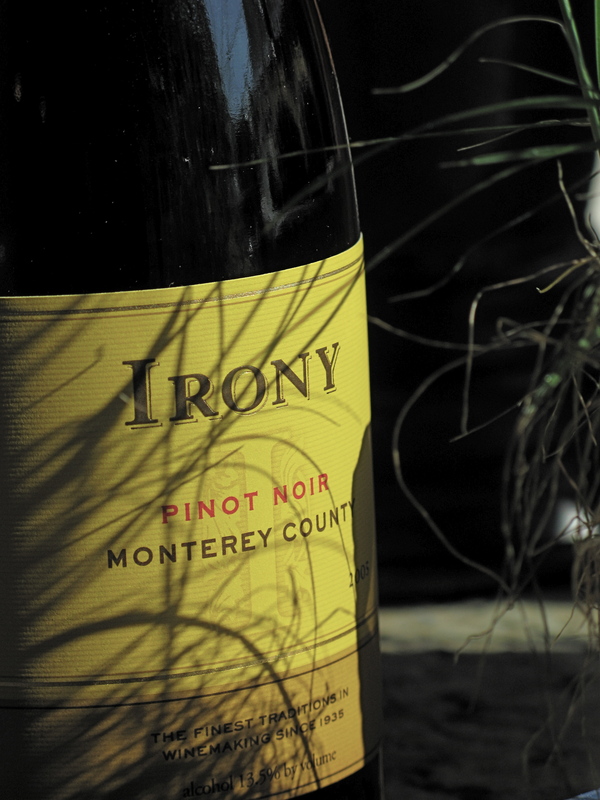 When I walked past the wine aisle at my local Dahl’s and saw the bottle of Irony, I couldn’t pass it up. The basic conflict that we are seeing is there are two kinds of people -people who see things in black or white, and those who can only see shades of gray. As a physician, I think this is rooted in neurobiology, like right or left handedness. I think it is wrong to judge either group particularly if you are in one or the other. This is basically the difference between people of science and people of faith. I really don’t think you can be both. Belief from the viewpoint of science is rooted in judging probabilities – you create statistical probability spaces, and you decide and calculate given certain conditions, the probability of x is y, and you can then calculate within a 95% certainty that where y is when x is a certain way. This is how quantum theory works, this is the basis of all science -you create a null hypothesis and you create conditions that test for a 95% certainty that the null hypothesis is not true. All shades of gray, but you can say for sure, 95% is pretty good odds, and that a 1 in a billion chance is, well, miraculous, and therefore not likely. With faith, things are far more concrete and in fact written in stone. People of faith measure things against certitude -a body of truths. They have faith that these truths are self evident and constant. They can’t stand relativism -that belief that the high ground you might think you are on is high only in the context of your relative beliefs and circumstances. Here is a simple series of tests. Did you like Seinfeld or Home Improvement when they were popular? When you read A Modest Proposal by Swift (link), were you put off, or did you get the joke? Did you ever read it? An unlicensed plumber with obvious antediluvian views on race (tap dance for me, n%#@$%) is now McCain’s second running mate -does this strike you as a false assertion or very ironic. As for me, I prefer my Irish babies roasted in a demiglaze with shallots and thyme, served with some Irony, after a nice bracing fall round of golf. 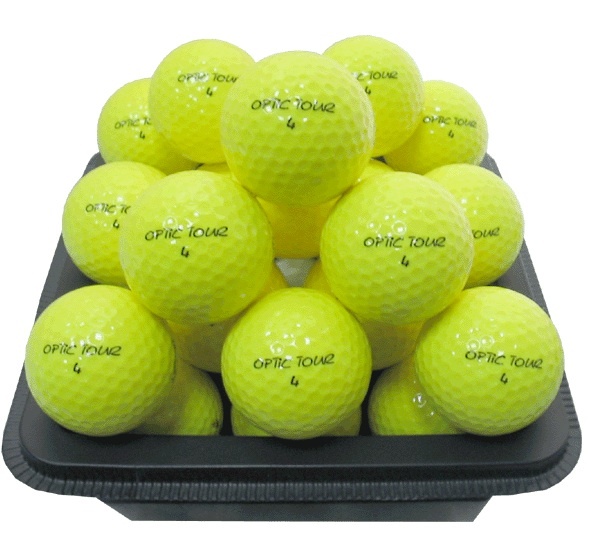 What happened to optic yellow golf balls? The optic yellow golf ball was my personal favorite during my childhood. Not too many people liked it. I liked the yellow Aviators and Prostaff’s as I could really smash my persimmon driver on them and usually find them. All the major golf ball manufacturers made yellow and orange balls for a time. Now, colored golf balls are relegated to the ladies. I think this is a sad state of affairs as I think that part of the appeal of the yellow golf ball is that it is not like everybody else’s golf ball. Looking around, I see for 2008, only Top Flight offers a “Distance Yellow” ball. I’m going to pick up a bunch. Imagine if you are of a certain age, and you now have time to take up golf. You can play in the middle of the week, and you take a few lessons, read some golf magazines, and you find a group of guys at your general skill level. All four of you take to the course as often as you can, and you poke the balls out there, never in the middle of the fairway, but into the thick stuff, only the thick stuff at Hype is only 2-3 inches deep, very forgiving. None of your clustered eight eyes see beyond general trajectories. One of you who may have been in the artillery during ‘Nam (not Korea, as you clearly are still walking), adds in wind into the general calculus. So after you hit your tee shots, and until you get on the green, the rate limiting step of your round is finding the golfball. The artillery guy waves his hands towards the bushes ahead, or to the cart path to the right or to the unconscious old guy to the left, and starts his partners on their mission, which now no longer is golf, but rather a gruesome easter egg hunt. I can hear their joints cracking across the fairway as they rustle about the rough. There is no glee in the dour faces of these gentleman, but rather the serious, searching squint of hunter-gatherers looking for their next meal. I do get it, as for these guys, the finding of balls, and not necessarily of their own balls, but of more balls, is basically the only reward they get as I have rarely seen any of these guys putt out -it’s a potlatch of plenty on the greens as they bestow five to ten footers to each other after spending five minutes each squinting and plotting their lag putts. Of course, there will always be one who insists of putting out, but he will spend five minutes on the one footer as well as the thirty footer. Imagine this multiplied by five or ten, and all of these fine men are hunting and gathering for balls, calculating and fussing over putts that they might make once a year, and never holing out which is the point of stroke play. Imagine this whole bunch unmarshalled and unregulated. They can’t see the group waiting behind them, and because they keep running into the group ahead, they assume that golf is always slow. And that is fine. They are experiencing golf in their own way. They are experience the joy of the wandering search. The fine air, the cool breeze, how many of these days do we have left to us? We don’t know but we know they are finite. I am happy they have their place to play at golf and at golf ball hunting. And I am glad to know where these people are.